Dandelions fascinate me. These pesky plants, often referred to as weeds, are hearty, resilient, and strong and at the same time delicate, graceful, and intricate. During the winter I had the chance to watch a dandelion transform through its growth phases. It somehow ended up thriving in an abandoned planter in my front yard—one of those spaces where I always have plans to have something beautiful grow—but lack of consistent watering and attention seem to spell doom for whatever I purposely plant there. We’d about given up on the planter, planning to relegate it to the back yard where it wouldn’t be such an eyesore—its been just a planter of dirt for some time–when I noticed a dandelion flower blooming bright and yellow seemingly oblivious to the neglect of this newfound home. 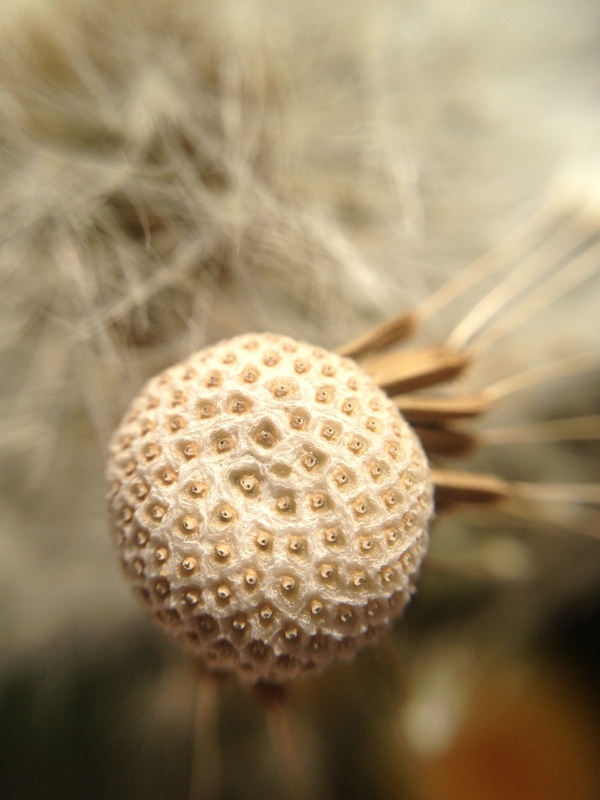 I grabbed my macro lens for my iphone and worked to capture that sunny globe. Each day as I arrived home from work, before the daylight had dimmed, I noticed another phase of the dandelion’s life and attempted to capture it with my macro lens. I love the way the macro forces me to slow my breathing, lean in close, and look carefully. Steadiness is paramount to a successful photo—and I find myself angling the lens this way and that as I work to achieve the optimal focus on some aspect of my subject. As the dandelion turned from yellow flower to white fluffball, I realize how little thought I had really given to these two very different versions of the same plant. 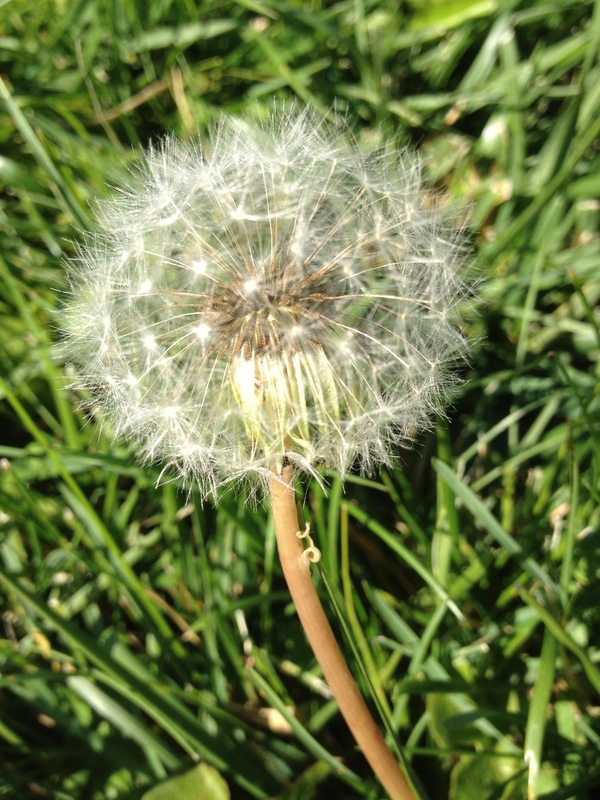 Like so many people I had played with these “weeds” as a child, picking these little fluffballs and blowing while I made wishes, never considering that I was in fact helping their cause as those pieces of fluff, each with a seed, attaches floated to a new home. I got closer still and worked to capture what happened day by day as the dandelion naturally progressed. And that’s when my view of dandelions was forever transformed. 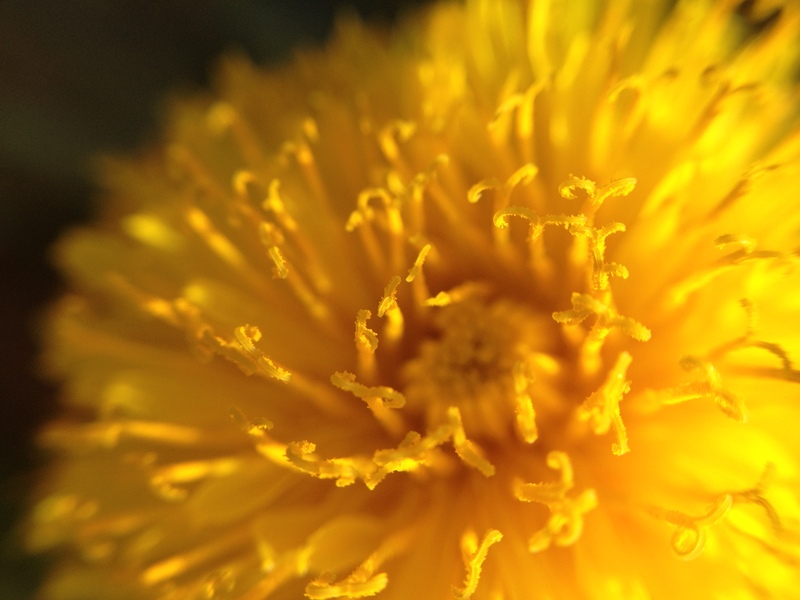 I became obsessed with taking pictures of dandelions…in all their states. And I began seeing what had once been ordinary in new and extraordinary ways. 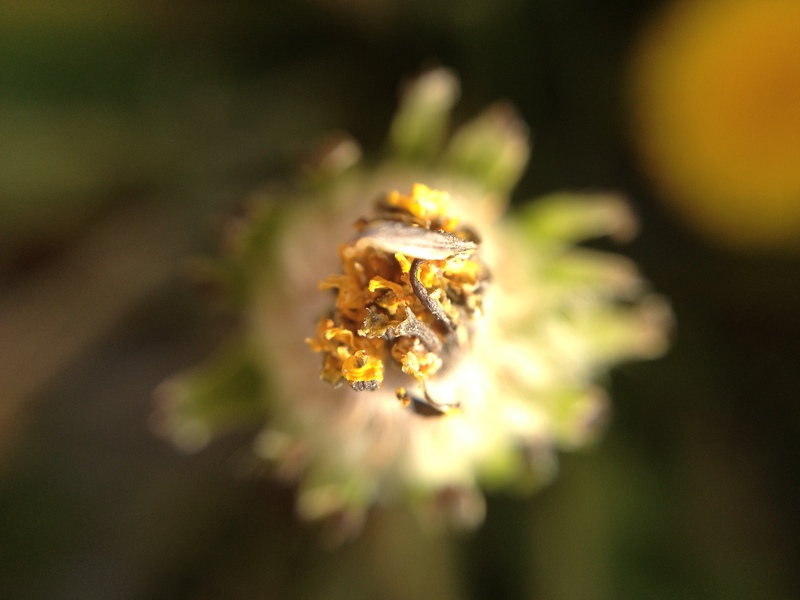 Instead of my “go about my business without paying too much attention to the little things” stance, I suddenly had a caterpillar’s eye view, which opened up new ways of seeing. So my takeaway…look closely and pay attention to the ordinary, searching for the hidden beauty. I feel like that’s also a lesson to heed even without my iphone in my hand. In my classroom and in my work with teachers I also need to search for the hidden beauty masked by the ordinary–that’s where the treasures lie. What treasures are hiding from you? 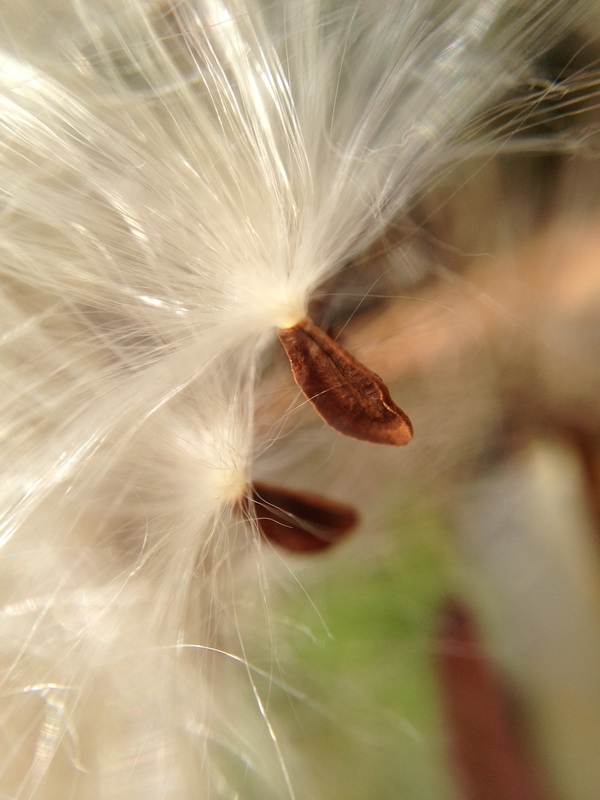 This entry was posted in photography, teaching and tagged dandelions, iphoneography, macro, observation, photo essay, photography, teaching on July 18, 2013 by kd0602. Wow. Your images are such visual poetry. It’s like you’ve captured the life cycle through the close-up of the flower/weed of the yard. We rip them up during spring, but they never seem to waver, always returning. We refuse the chemicals and live with the fact that each year, we are in it against the temporary beautiful yellow companions that dot our yard. Thanks so much! There’s a lot to learn from something as seemingly simple as a persistent yellow flower! I think the process you outline is so shareable. All understanding and judgment spring from observing in all its forms–noticing, measuring, sensing, sharing delight. 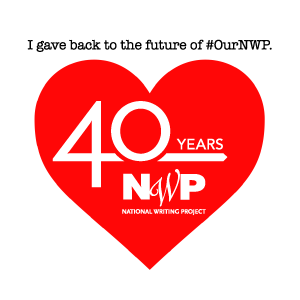 And, to my mind most important, remixable but not copyable. All reflection is a “one off” product. 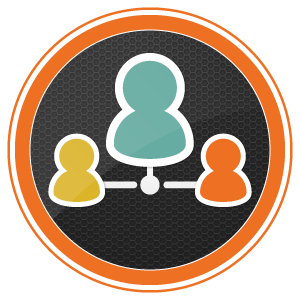 Luckily, we (through you) can make on our own by folowing the process you picture in your post. Thank you. 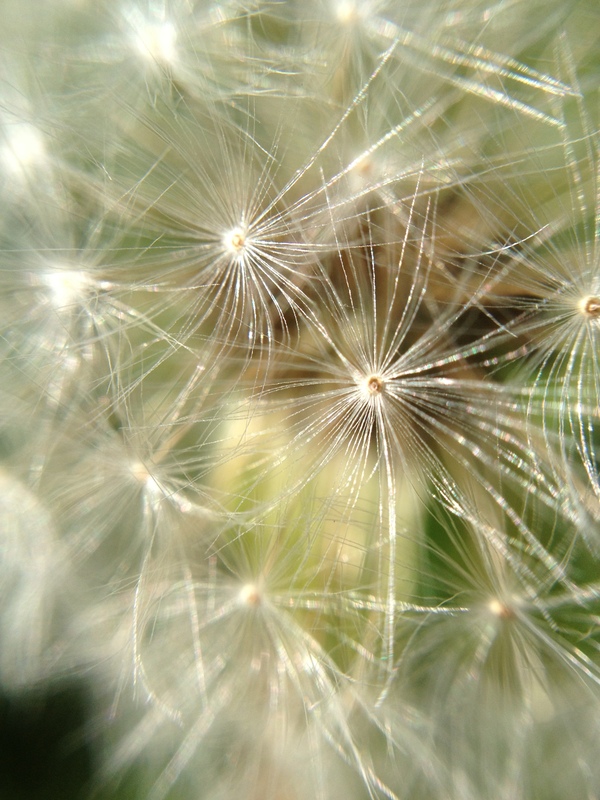 Interesting read on dandelions. I never knew they were yellow before turning white. I used to love playing with these as a kid. Thanks for the info and pics. Those lens take amazing pictures. Such detail. I did not know either that dandelions where yellow before they where wire fluffy balls. These photos are absolutely amazing! How long did it take for the dandelion to turn white?